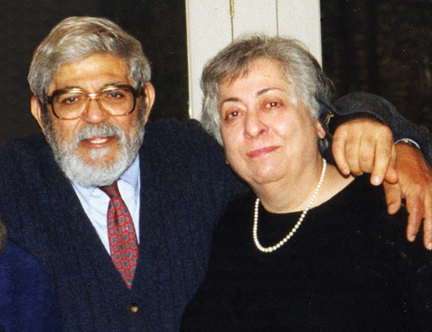 Philip and Pauline Metzidakis were “beloved figures” on campus. According to their son Philip Metzidakis ’79, both of his parents came from similar immigrant backgrounds. Professor Metzidakis’s parents came to the United States from Crete, and his mother’s parents were Armenian survivors of the Turkish massacre of 1915. Born in 1931 in Springfield, Mass., Metzidakis was an outstanding football player who was recruited by Dartmouth College from Classical High School in Springfield. “He went to Dartmouth on an athletic scholarship but destroyed his knee in a game against Army during his freshman year,” his son says. “They took away his scholarship, but my grandfather, a shoemaker, kept his store open seven days a week,” determined to keep his son at the prestigious college. Metzidakis himself took a job at a Dartmouth fraternity, cleaning the house and doing odd jobs in exchange for room and board. “He began in premed but soon found that he was more interested in Spanish literature and Latin,” says Philip. After graduating from Dartmouth, he studied at the Universidad de Salamanca, earning degrees in Hispanic philology and Hispanic studies. He received a Ph.D. in Spanish from Yale University in 1960. Metzidakis came to Swarthmore in 1968 from Mills College, where he served as an associate professor and chairman of the Department of Foreign Languages. He had previously held teaching positions at Yale and Trinity College. Metzidakis conveyed a love of Spanish literature spanning the medieval, Renaissance, and baroque eras as well as the 19th and 20th centuries. His classes and seminars on Cervantes, Miguel de Unamuno, and García Lorca became legendary for the way he brought the various characters to life. But it was Unamuno, the prolific author and influential figure in early 20th-century Spain, whom he once described as “essentially ungraspable and maddeningly paradoxical,” who really captured Metzidakis’s imagination. In addition to his Yale dissertation “Unamuno e Hispanoamérica,” he further examined the legacy of the man he referred to as the “anguished Spaniard” in the edited volume Las Mejores Paginas de Unamuno (1966) and The Modern Greece of Unamuno (1989) as well as in numerous essays, articles, and reviews. 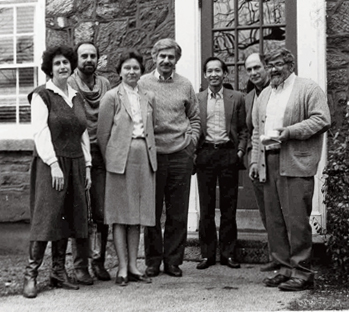 Metzidakis (at right) posed for the 1985 Halcyon with (from left) Marion Faber, George Moskos, Jean Perkins, George Avery, Ken Luk, and Robert Rosa. Moskos passed away on Jan. 4; an obituary will appear in the April Bulletin. Metzidakis served variously as chair of the department of modern languages and literatures as well as the Spanish section. He was also a frequent director of the Hamilton Program in Madrid—a consortium consisting of Swarthmore, Hamilton, and Williams colleges—where he introduced countless students to the fascinating history, culture, politics, and language of the Iberian world. 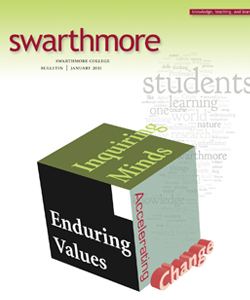 Thank you for the article on Professor Metzidakis (Swarthmore Bulletin January 2011). He was a wonderful teacher who instilled a genuine love of learning in his students. I have long since forgotten most of what I once knew about Spanish literature and culture, but I vividly remember that it was a joy to attend his classes. I learned much from him about what constitutes good teaching, and memories of his inspiring example have stayed with me throughout my own academic career.